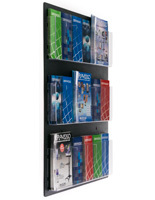 This wall literature rack offers a convenient means of displaying a large number of magazines and brochures. The back and pockets are made with high quality clear acrylic. 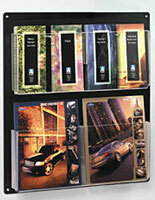 Each wall literature rack features nine full-sized pockets that can be converted into eighteen pockets suitable for pamphlets. Choose to use one separator or all nine to create a custom display. 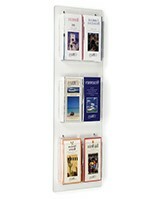 This brochure holder, wall literature rack is easy to maintain and customize. The snap-in dividers are inserted into the holes located in each pocket. 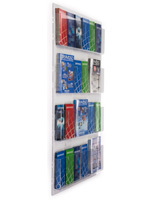 This wall literature rack, also known as a hanging magazine rack is a popular means of organizing reading material in a medical office or public space. 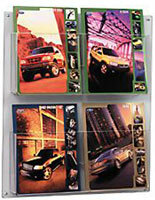 Car dealerships and travel agents buy this mounted display in bulk quantities. 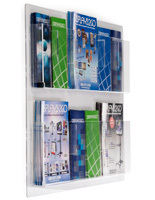 This wall literature rack offers an unobstructed view of magazines and brochures and blends with any décor. Each pocket can hold standard 8.5" wide material, while the divided pocket is intended for 4" wide brochures. Use this wall literature rack to present a professional image, and keep the magazines from being cluttered on the waiting room furniture. The clear acrylic construction is neutral, enabling this flyer organizer to blend with any type of setting. Each wall literature rack features a pre-drilled hole in the corner of the backboard for easy mounting. All of the required hardware; screws and anchors, are included. 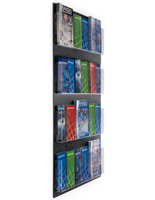 Purchase this wall literature rack before 3PM for same day shipping! We ordered several of these last year and were very pleased with the quality, ease of installation, flexibility and sleek design. This order was the next size up and we are very happy with it! Thank you so much for being a returning customer and for taking the time to write this excellent review! We're so happy that you found this literature rack to be high-quality and easy to install. We hope you enjoy your new display, and we look forward to doing business with you again soon. Display case works great for the space we have. The flexibility of sizes is great! Hi Bryan! Thank you for taking the time to write this review. 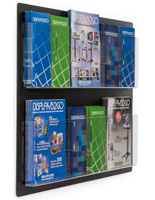 We're glad that you love the versatility of this literature rack, and we hope you'll continue to turn to Displays2go for your business's display needs. This is a great product. works great to display our rack cards at our various locations. received it in a very timely manner and the product exceeded our expectations, We ordered one for our medical office to see the quality and will be purchasing another. Pamela, thank you so much for the excellent review! We're thrilled that our literature rack exceeded your expectations and hope it helps to cleanly present important information at your medical office. This item provided a modern update to our flyer rack. Clean, simple and functional. Great price, too.